The set contains one new card type. Cards of this type—conspiracies—don’t go into your deck. Instead, you put all of them right into play at the start of the game. They aren’t usually all that strong, but any kind of free resource is valuable, so they should be worth drafting. Some conspiracies have the hidden agenda subtype. 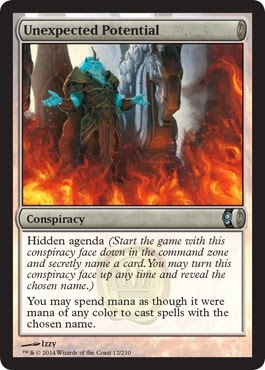 You play a hidden agenda face down and write down the name of a card. At any time, you can turn the hidden agenda face up, at which point it takes effect. Dethrone is a new keyword. A creature with dethrone gets a +1/+1 counter whenever it attacks the player with the highest life total or a player tied for the highest life total. This is clearly aimed at making multiplayer more fun by encouraging players to focus their efforts at whoever’s ahead instead of knocking a trailing player out of the game. Will of the council is an ability phrase that calls for all players to vote on an effect. This is aimed at generating interesting political situations in multiplayer, but because the controller always breaks ties, it should often be strong in two-player games as well. The last new ability word, parley, has each player reveal the top card in his or her library and draw it, and generates an effect based on what cards were revealed. Parley’s multiplayer utility is less obvious, but letting everyone see cards as they’re drawn should give sharp-eyed players an advantage. The set will have 210 cards—80 commons, 60 uncommons, 35 rares, and 10 mythic rares. Only 65 cards are new; the remainder are reprints, although these include a few doozies such as Altar of Dementia; Edric, Spymaster of Trest; Mirari’s Wake; Pernicious Deed; Phage the Untouchable; Spiritmonger; and the ever-popular Squirrel Nest. Conspiracy is scheduled for release on June 6.